End of terrace house on three floors well decorated and tastefully furnished. Wide ranging views from the village to the lake and surrounding countryside. Spacious rooms which are light and airy. Large living area with sofa bed and dining table for eight. access to the walled courtyard garden. A small music centre which takes CD is available for your use also television. Contemporary style kitchen with plenty of storage and work top, electric cooker, fridge freezer, dishwasher and microwave. A separate shower room with WC at this level. On the third floor there are three bedrooms, two double bedded rooms and a twin. The second double bedroom is reached through the twin bedded room. Family bathroom has a bath and hand shower and wash handbasin. There is also a second separate WC. The garage and cellar areas house the front loading washing machine. Travel Cot and high chair provided. The beautiful mature walled courtyard has a built in barbecue and outdoor furniture including sun beds. Parking: There is space to park the car in front of the house. Rates inclusive of cleaning, linen and electricity. Telephone available for incoming calls, outgoing calls can be made using a calling card. LOW SEASON RATES with oil fired central heating, please enquire. 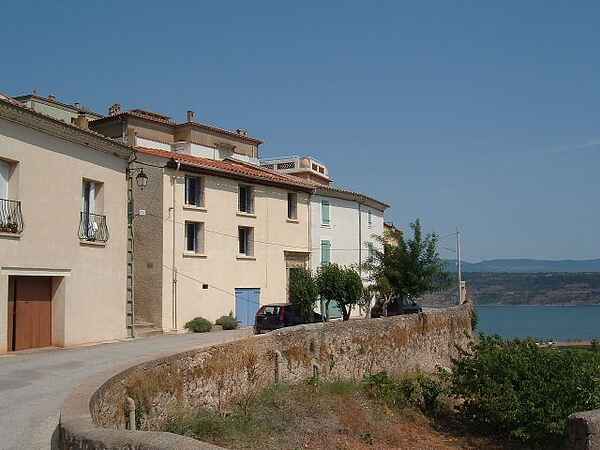 Liausson is a picturesque village overlooking the spectacular Lac Salagou. An ideal location for holiday makers who enjoy walking, cycling, sailing or fishing. The Lake is wonderful for swimming and windsurfing as well as being safe for small children. There are sailing centres on the lake where you can hire small sailing boats, windsurfers or pedaloes. Also a cycle hire centre. Horse riding available locally. There are well marked cycle and walking paths around the lake. Mediterranean beaches 45minutes. There are a choice of restaurants in the neighbouring villages and a snack bar operates in the village during the summer months.. Market town of Clermont L'Herault 10 mins drive, there you will find a wide range of shops, supermarkets and restaurants.